Linda’s KLIK submission is delicate and light. Her colour choices resulted in such a pleasing bezel. I often forget that the simple act of layering paper can create unique framing options. Her first piece of paper has vintage text and then the second collage paper frames her butterfly perfectly. The butterfly has two layers of resin glazed wings making it a 3D embellishment. The crystal in the butterfly back is the icing on the cake. 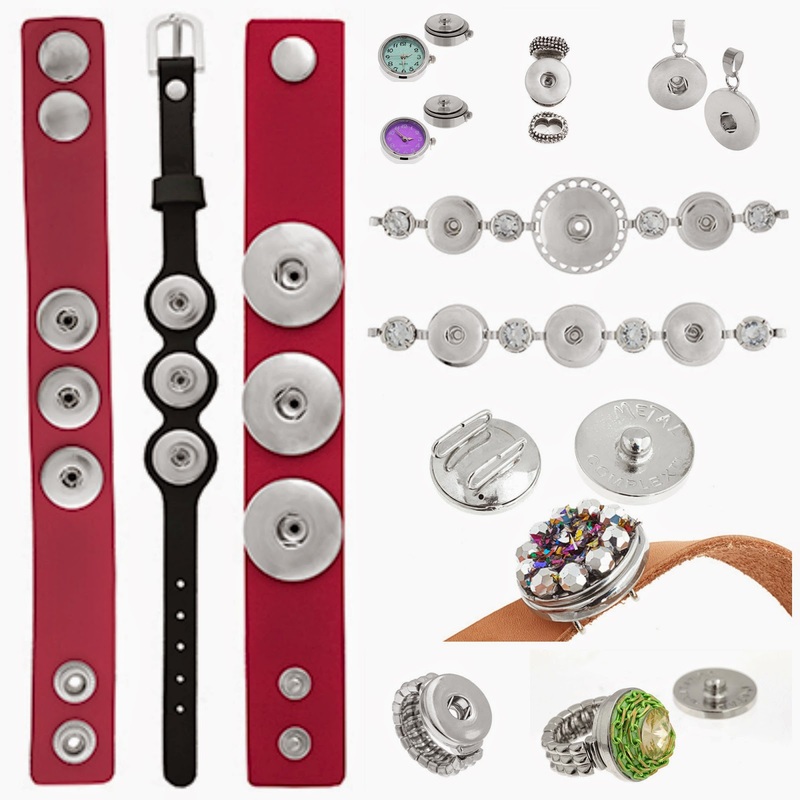 Carla thought long and hard about what to put into her KLIK bezel snap. She reviewed her stickers, papers, baubles and beads and then finally found a focal bead to inspire her. This turquoise cross framed by red coral beads and then a final frame of seed beads is just gorgeous. I have never seen anything similar and it is the only submission featuring beads in this way. I laughed when she noted that one whole hank of beads ended up in her carpet when she was working on this piece. Cat companions always have issues with seed beads! Carla glued all her beads in place and then very slowly and cautiously added her resin. Since she did not completely cover everything, her turquoise and coral look natural and truly Indian inspired. Well done Carla! This next submission would received my award for best shipping idea! 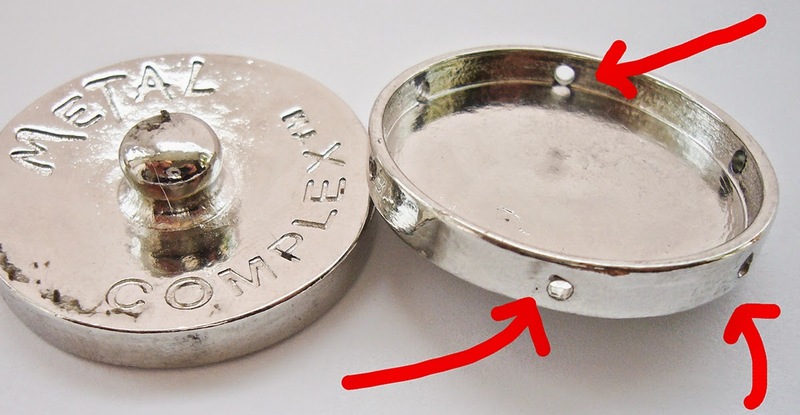 Monica Cormier packed her small bezel safely into a bottle cap. It is truly amazing to see what artists did in the small snaps. Monica used acrylic paint, glass beads and sand from her favorite beach in Florida for her submission. She noted “this has become a memory piece, of a wonderful trip and beach.” I think this is a wonderful example of what embedding inclusions and in resin can be. A wonderful and permanent keepsake. I feel like Monica captured one small moment of time. Laurel’s whimsical submission is a personal favorite due to its showcasing of a unicorn. However, her background and unicorn base really deserves most of the attention. I have no idea how she created the brightly hued and metallic background. The rainbow of colour is idyllic for a unicorn scene. I also am very drawn to the black, glittery ground her charm is walking on. This submission would stand out no matter where I placed it. I think I will need to pair it with two small KLIK snaps featuring only bright colours. Having featured Nancy’s work in several posts on this blog, this submission will not surprise any of her followers. 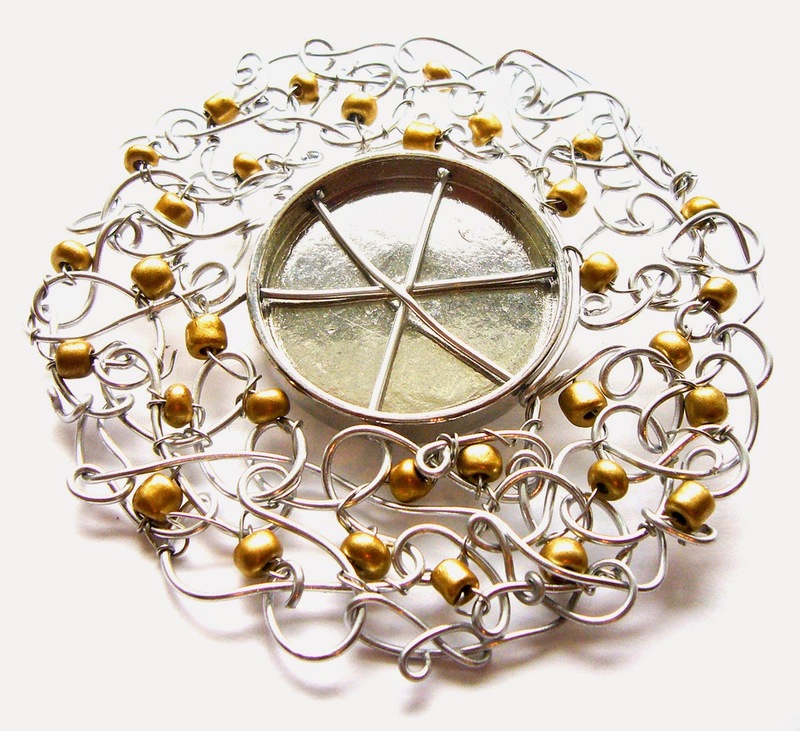 Nancy loves wire working and so her bezel has been transformed into a completely new and exciting size and shape. Our Jewelry Clay is holding her tiny glass beads and bee in place. Happily, she shared her technique for adding such an exotic wire and bead frame. Here is how it was possible to attach all this wiring. Once she completely the frame, she filled the KLIK snap with Jewelry Clay giving it even more strength. I observed Nancy making the holes in her bezel snap. She used a battery powered dermal-the holes were easy to drill. Nancy’s submission also included some over-the-top soutache frames that will be featured on the Dazzle-it Blog. Here is a peek at those fiber frames! Another exciting group of KLIK submissions! Over 50 artists were the first to receive the new Snap Bezel designed by Metal Complex. They received either the small or large bezel to work in. These “blank” snap bezels “klik” into place when combined with the other jewelry-making components in the new KLIK collection. 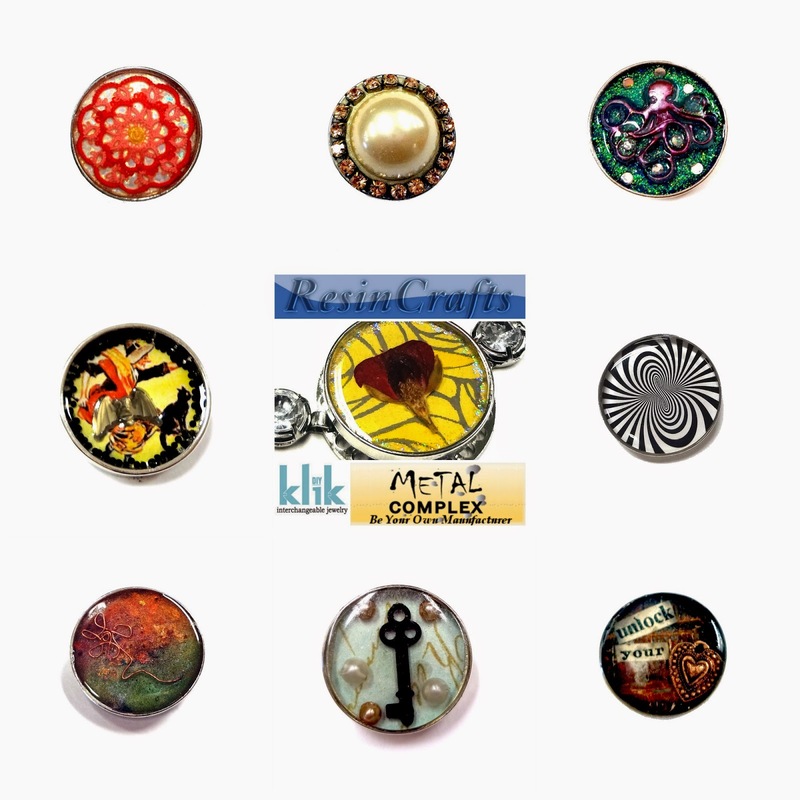 You can see the entire line in the catalog on the Metal Complex website linked here. The full introduction to the collaboration is posted here. Kayleighs submission had me stumped the moment I pulled it out of the envelop. My photo does not clearly show how ornate it really is. I am not sure how she got these layers of glittery goodness! The black lines appear to be suspended so that the flakes are contained on the bottom. No matter. I don’t need to know everything. I can enjoy this KLIK submission as a beautiful entry. Kim submitted a royal klik snap. All the bezels I am featuring today are the small one’s (about a half inch wide) so they really had to work with tiny items. Kim found a very small brass crown which she placed over her swirled paper background. The suspended crystal looks like a diamond. Dianna’s submission would have anyone reaching out a finger to touch the items attached. I twisted and turned this KLIK bezel over and over and then finally read the enclosed note. Dianna works with polymer clay and ETI’s Envirotex Lite. Her attached “chips” look just like gemstone but are so lightweight. Here is a side view. I love how her resin application was used to attach the silver embellishments as well. Nicole’s submission will make our dried flower enthusiasts very happy. Isn’t it just wonderful? These is so much going on in this tiny metal canvas. Nicole painted the bezel metallic teal and then glued in printed vellum. She glued mini beads to the edges and embedded a California buttercup and one other unidentified flower. The flowers, she pressed herself and noted that the tiny white ones came from an ornamental bush. Nicole included a number of gorgeous postcards for me to use in my projects. Thank you!! Over 50 artists were the first to receive the new Snap Bezel designed by Metal Complex. They received either the small or large bezel to work in. These “blank” snap bezels “klik” into place when combined with the other jewelry-making components in the new KLIK collection. You can see the entire line in the catalog on the Metal Complex website linked here. 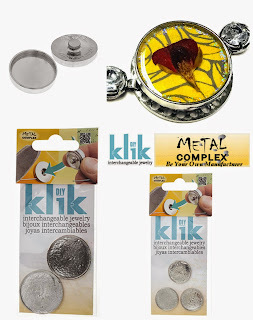 The KLIK collaboration with Metal Complex this month is showcasing a unique blank bezel snap. The snaps are just one part of a major product launch this fall of the matching components. You can see them all in the online catalog. If you had the entire line to choose from this is what your wall would look like. 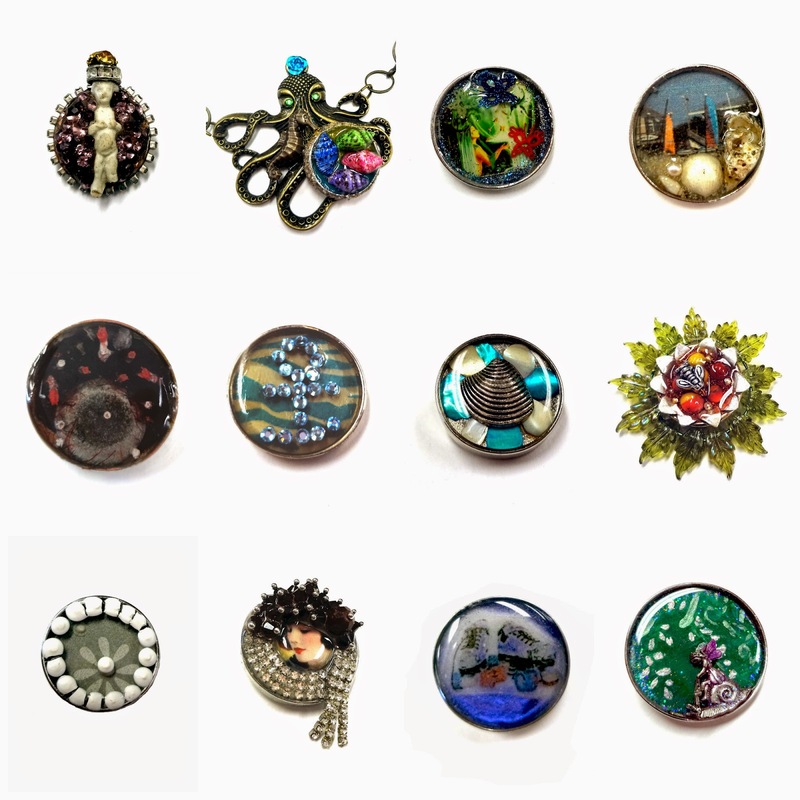 Resin Crafts blog readers are submitting their one of a kind designs. I am featuring each KLIK submission here and on Facebook. It truly is an inspiring collaboration! These are the components I used to create today’s final photo. More KLIK projects are being posted all week! They received either the small or large bezel to work in. These “blank” snap bezels “klik” into place when combined with the other jewelry-making components in the new KLIK collection. You can see the entire line in the catalog on the Metal Complex website linked here. When I opened my envelope from Alma I knew I had a gorgeous submission. Then I read her note. “As a tater, I wanted to include my own lace making into it.” Full stop. The teeny tiny butterflies are tatted! The blue tatted butterfly is covered in resin, but it is only partially submerged. I can’t imagine the time it took to make these tiny lace items. The image is also gorgeous with the glittered edge work. I am certain needlework artisans everywhere are going to be happy to see this mini work of art. Kim is from Arizona and I couldn’t help but think about their recent flooding when I saw the anchor shape on her submission. These crystals are embedded on top of the resin, so that you can still feel them. This is a wonderful technique and if you time your resin cure, you can push your crystal into place at a point where they will still stand up but remain on top of the pour. The wavy blue and beige background does indeed look like water. Kerry, Kerry, Kerry, you need to move into my studio to explain how it is that you are creating such marvels in resin. My photo does not capture the complexity of her piece. I literally had to get a magnifying glass out to study it further. I think there is a stone embedded and some thin red fibers. Lines and dots are embedded at various heights. Sometimes I think it is staring at me. Or we may be in space. It is just fabulous resin project. Suze Weinberg and I subscribe to the “add just one more thing” school of embellishment. Her vintage tiny frozen Charlotte doll is partially embedded in a crystal covered hill of clay. The rhinestone frame around the KLIK snap is elegant and what can I say about a crown of jewels? Wonderful. Suze worked in the tiny snap…and managed to get all this into her submission. Okay, like many of you I just swooned when I opened Diana’s envelope. What more can I add to a photograph that shows you that Diana incorporated so many gorgeous things into her submission. Clay is making it possible for her burgundy beads to sit at such a gorgeous height and vintage rhinestone frames the lady like a collar. Her face is embedded in resin. This piece has encouraged me to think outside of the frame. Debbie’s submission could use a whole blog post. Holding this mini work of art made me realize that I needed to give you a side view as well. Debbie used Resin Clay to adhere the silver petals disk which houses her little glass cabochons. She made them herself. A large brass brass jump ring (genius) adhered to the top of her KLIK snap made her piece deeper. She filled it with glass glitter, beads and the little bee charm. The green leaves are leftover from a beaded napkin ring kit. It was all sealed with Jewelry Resin. Would you believe this is the first time Donna has used resin? Her submission “Fairy in the Wisteria” bezel was her opportunity to experiment. I can see the green background has metallic lines and glitter. Her little fairy is partially suspended in resin. Her wings have been coloured making her stand out even more. Welcome to the world of resin craft Donna! I noticed that Amber lives in Florida, so I am certain access to shells would come easier to her. Amber worked in the small KLIK bezel. When I pulled her submission out of the envelope I just had to stop and release a sigh. This is so elegant. I always try to create something like this…and then I over-embellish. This tiny snap is perfect. 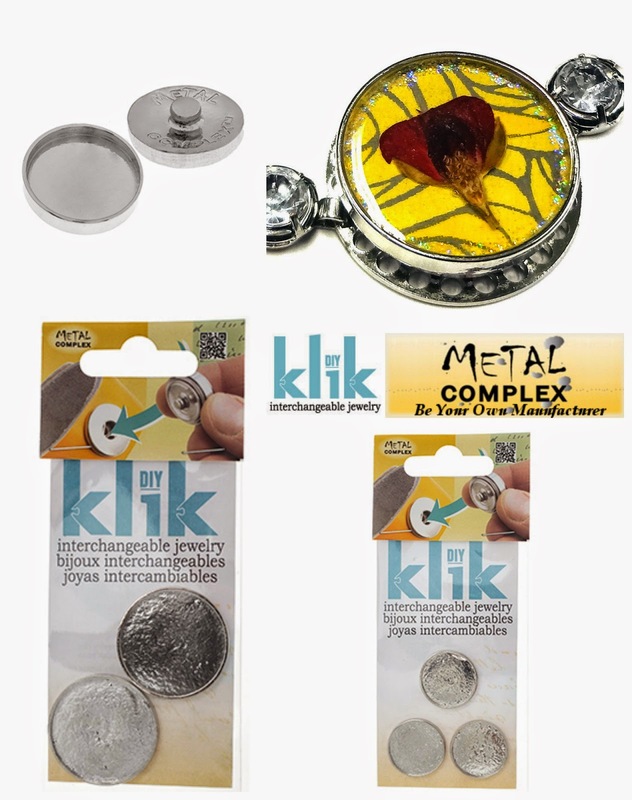 Canada’s Favorite Bead Store now has the KLIK components in their online store. Gwen titled her submission “Sinister Serenity’s First Pair.” I have a feeling these roller skates have a story. My photo does not capture the gorgeous metallic background Gwen created for her tiny skating imagery. She worked in the small Klik bezel snap yet managed to layer the colour and paper imagery before pouring in her resin. Gwen took some time to include a note which said ” I’ve tried to read all of your posts as I am so inspired and want to try everything.” Thank you for participating Gwen! Teri’s sailboat background comes to life with the addition of real shells. She has even included sand. This KLIK components captures a scene we are all familiar with. I am sure it makes more than a few of us think of a favorite marina. Teri took this photo and selected shells from the same location for her keepsake. Janice also worked in a small KlIK snap. Her submission reminds me that there are so many unique styles of art. Her silver/gray background already featured a flower which is highlighted by the thick white paint dots. The dots, are not completely covered by resin, so when you hold this submission in your hand you can feel the dot tops. Sherri and I emailed back and forth about her submission. She had this idea and knew that her KLIK component would no longer be “klickable” once she was done. I think she was brilliant to use the bezel in her own way. She received a small bezel…but created a BIG project. Her bezel sides are now uniquely altered by the addition of a sandy frame. Her shells are floating in resin and appear wet. She drilled a hole into her octopus and attached the snap as though it was already designed to live there. It really is a wonderful entry to our KLIK collaboration. Thank you so much for sharing it! Sherri sent me the completed necklace! The colour palette in Lisa’s KLIK bezel is one I love; green and purple. The Octopus appears to be floating on the surface of this glittery water background made with glitters and tiny sequins. There are even a few Swarovski crystals embedded. As if that wasn’t enough, the underside of the octopus glows in the dark! Lisa, will have to write in and tell us how she made that happen! I am always so pleased when well-known author Lisa participates in one of my collaborations. This bezel features a wonderful way to display a HUGE pearl. She embedded it into clay which was coloured with a light gold powder. The rhinestone edging is so high because of the clay base. Here is a side view of Lisa’s KLIK snap bezel. I imagine a few of us will be rifling through our broken jewels to see if we can find something similar to embed in clay next. Alison sent in her submission with the simple title of “Sunset with wire flower.” I thought that immediately when I unpacked her submission. Her coppery metallic patina is just gorgeous and creates a bezel that is one-of-a-kind. You would be hard pressed to try and make a copy. The little wire flower is a delicate and elegant addition. With the cooler mornings I am day dreaming about France and the annual showing of fields of lavender in Provence. I would really like to see this in person some day. In the mean time, I can still add a little of the Provence feeling to my life with these stamped metal bracelets from Metal Complex. My bookmark is the ideal artwork to permanently embed in resin. I used Jewelry Resin for this project. Once my images were placed in the open bezels and sealed with mod podge I poured resin into each opening. The bracelet blank bottoms are not completely flat, so I suspended my bracelet this way before I poured in the resin. You can do so much in these bracelets. They are a blank canvas for your creativity.